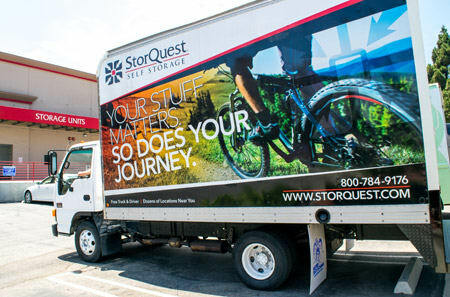 At StorQuest Self Storage, we help Aurora and Hutchinson Heights residents get organized. Our facility on Tower Road has been specially designed to accommodate your unique needs. Whether you need to store business files, outdoor equipment, holiday decorations, or even the contents of an entire house, we have a space for you. Our facility is accessible seven days a week and is monitored by 24-hour digital surveillance. For the convenience of our commercial storage customers, we will be happy to accept deliveries on your behalf and provide you with free email invoicing. Heated and cooled storage units are available, as are boxes, locks, and moving supplies. Visit us in our office for more information on the features we offer. At StorQuest Self Storage in Aurora, CO, we want to help you by making self storage more accessible. That is why we offer a truck and driver at move-in. Simply contact our leasing office to schedule your move-in date and we'll do the rest! Complimentary dollies and carts are available at our facility to further ease the process. We also offer U-Haul moving truck rentals. Let our staff help you prepare for your next move.